I was born with the straightest hair. It was so straight it would not hold a curl. Overtime my hair has gained a wave too it, possibly from hormone imbalance. Regardless, I usually straighten my hair once or twice a week. 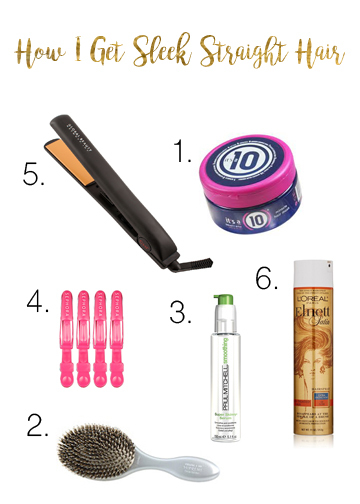 With a little trial and error I have found the perfect products to achieve the ultimate sleek hair. Sleek hair is healthy, which makes a good hair mask important. This is my favorite one. It really moisturizes the hair, leaves it looking healthy and smooth. The mask also smells really good. I use it once a week after shampoo. I leave it in for about five minutes before applying conditioner. Best part about this mask is that it combats my frizz without weighting it down. A majority of the time I use a paddle brush but this one is great for evenly distributing natural oils and product throughout the hair. I have a ton of hair but it is very fine so I only use a pea size amount. Any more than that and my hair will look unwashed and weighted down. When used just right, this stuff is magic! Not only does it smooth hair out but leave a little glossy shine. You can put it in while the hair is still wet but I recommend doing so after the hair is dry. So that I do not miss any spots I will clip up the hair on the top of my head and straighten the hair underneath first. These clips stay where you put them. I love this flat iron because it is reasonably priced. Not only can I straighten my hair but the design makes it easy to curl hair with it as well. Yay for dual purpose! After hair is completely dry I will run this tool through my hair once or twice. I like to mist my hair with a little hairspray because this Texas humidity can sometimes play a little trick on my hair. I also like to tease the roots just a bit to give it a little volume and keep it from looking too flat against my head. I will spray a little of this at the root when I am done.